This page contains an extract from "Cheshire Gleanings" written by William E. A. Axon and published in 1884. The quotation is verbatim. Following it is the poem about the Wizard that appears in "Alderley Edge And its Neighbourhood" written by the Honourable Miss Louisa D. Stanley (published in 1843, reprinted 1972). Axon used the story told in Miss Stanley's book as the basis for his version. Next, there is reference to the books by Alan Garner which include references to Alderley and its legend. I have added a note on the places referred to in the text and also a modern version of the Legend poem. 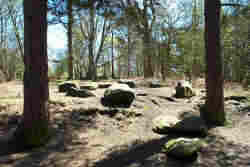 "Connected with Alderley Edge there is a curious tradition which preserves a very ancient fragment of mythological belief, and is, therefore, worthy of notice. "The legend of the wizard of Alderley Edge first appeared in print in the Manchester Mail of 1805, by a correspondent who obtained it from the narration of a servant of the Stanleys, whose proper name was Thomas Broadhurst, but who was better known as "Old Daddy." According to this veteran the tradition says that once upon a time a farmer from Mobberley, mounted on a milk-white horse, was crossing the Edge on his way to Macclesfield to sell the animal. He had reached a spot known as the Thieves' Hole, and, as he slowly rode along thinking of the profitable bargain which he hoped to make, was startled by the sudden appearance of an old man, tall and strangely clad in a deep flowing garment. The old man ordered him to stop, told him that he knew the errand upon which the rider was bent, and offered a sum of money for the horse. The farmer, however, refused the offer, not thinking it sufficient. "Go, then, to Macclesfield," said the old man, "but mark my words, you will not sell the horse. Should you find my words come true, meet me this evening, and I will buy your horse." The farmer laughed at such a prophecy, and went on his way. To his great surprise, and greater disappointment, nobody would buy, though all admired his beautiful horse. He was, therefore, compelled to return. On approaching the Edge he saw the old man again. Checking his horse's pace, he began to consider how far it might be prudent to deal with a perfect stranger in so lonely a place. However, while he was considering what to do, the old man commanded him, "Follow me!" Silently the old man led him by the Seven Firs, the Golden Stone, by Stormy Point, and Saddle Bole. Just as the farmer was beginning to think he bad gone far enough he fancied that he heard a horse neighing underground. Again he heard it. Stretching forth his arm the old man touched a rock with a wand, and immediately the farmer saw a ponderous pair of iron gates, which, with a sound like thunder, flew open. The horse reared bolt upright, and the terrified farmer fell on his knees praying that his life might be spared. "Fear nothing," spoke the Wizard, "and behold a sight which no mortal eye has ever looked upon." They went into the cave. In a long succession of caverns the farmer saw a countless number of men and horses, the latter milk-white, and all fast asleep. In the innermost cavern heaps of treasure were piled up on the ground. From these glittering heaps the old man bade the farmer take the price he desired for his horse, and thus addressed him: "You see these men and horses; the number was not complete. Your horse was wanted to make it complete. Remember my words, there will come a day when these men and these horses, awakening from their enchanted slumber, will descend into the plain, decide the fate of a great battle, and save their country. This shall be when George the son of George shall reign. Go home in safety. Leave your horse with me. No harm will befall you; but henceforward no mortal eye will ever look upon the iron gates. Begone!" The farmer lost no time in obeying. He heard the iron gates close with the same fearful sounds with which they were opened, and made the best of his way to Mobberley." The Wizard of Alderley Edge. And wake the armed band! 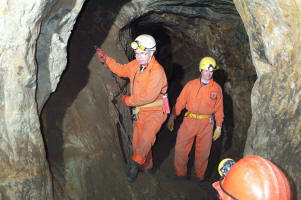 Alan Garner, the author, has written a number of books that draw on elements of the history of the mines. In the Stone Book Quartet, he gives an account of a descent into Engine Vein following the real route down Blue Shaft for part of the way. In the Weirdstone of Brisingamen, he gives a very detailed account of the journey of Colin and Susan through West Mine by way of Doctor's Shaft, the top caverns, Plank Shaft, back to Dog Chamber and Chain Shaft (see pictures), through Wood Mine before emerging in Engine Vein. Parts are fiction but parts are very vivid and accurate descriptions. 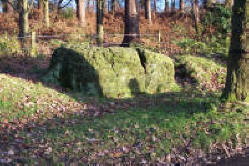 There is a fuller description of Alan's contribution to the Edge on a separate page and a further page on the Weirdstone. 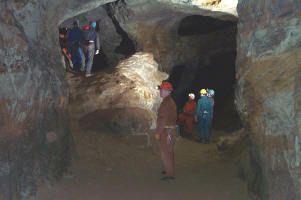 The Lion Chamber is so named after the rock formation in the centre. Colin and Susan sat on a ledge around the upper part of this chamber, in darkness in this picture. The Chain Shaft is on a fault and connects several levels. Colin and Susan dropped from this level down to the water-filled railway tunnel at the bottom. Seven Firs: by the adit entrance to Engine Vein at SJ 8607.7744. This may be an old earth work. The Iron Gates: your guess is as good as mine! The verse below is a version of the legend found in the Club archives. There is another version which has additional verses added in 1988 by Tom Fowden to bring in a few members' names. This version is only available as a PDF file HERE. You will need to be a DCC member to read the Club version. A strange looking figure with long hair and beard. "Pray sell me your horse, you can name your own price"
But the farmer derided the stranger's advice. Old man stand aside I must be on my way". "Your horse is a part of a mightier plan. I'll wait for you here on your way back tonight"
And without more ado disappeared from his sight. Though all praised the mare no one offered to pay. When he tried to go on, the white mare would not. Full knowing his offer he'd no longer spurn. "I'm in no position to turn you down twice"
The farmer declared "You can name your own price". And mid claps of thunder the rock split in half. No less than one hundred and forty brave knights. And each ? save for one ? had a mare by his side. "Till England in peril shall call them to serve". To drive England's enemies into the main. But forgive me for stating they're short of one horse". A mountain of precious stone, silver and gold. "Take what you can carry and I'll keep your mare". He filled all his pockets his shirt and his fist. Through tunnel and gates and the solid rock face. 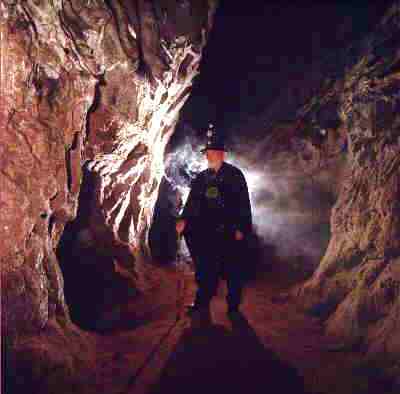 Of Wizard, or knights or a cave underground. That when it is quiet they hear a soft NEIGH.